NEEDHAM Market based Fern Teather has certainly upped her game in recent months and is clearly benefitting from a series of high profile gigs in the summer. The performing arts student at Suffolk New College was a busy girl, appearing at Ipswich Music Day, Ely Folk festival and the Ipswich Maritime Festival to name but three. 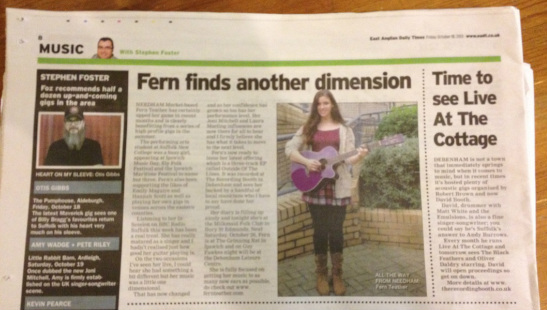 Fern's also been supporting the likes of Emily Maguire and Hannah Scott as well as playing her own gigs in venues across the Eastern Counties. Listening to her in Session on BBC Radio Suffolk this week has been a real treat. She has really matured as a singer and I hadn't realised just how good her guitar playing is. On the two occasions I have seen her live, I could hear that she had something a bit different but her music was a little one dimensional. That has now changed and has her confidence has grown so too has her performance level. Her Joni Mitchell and Laura Marling influences are now there for all to hear and I firmly believe she has what it takes to move up to the next level. Fern's now ready to issue her latest offering which is a three-track EP called Outside of the Lines. It was recorded at The Recording Booth in Debenham and sees her backed by a handful of local musicians who I have to say have done her proud. Her diary is filling up nicely and tonight she's at The Milkmaid Folk Club in Bury St. Edmunds. Next Saturday, October 26th, Fern is at The Grinning Rat in Ipswich and on Guy Fawkes night will be at the Debenham Leisure Centre.